Justice Robie was appointed by the Supreme Court as an initial member and CJEO chair in 2009. He began his judicial career at the Sacramento County Municipal Court in 1983. Elected to the Sacramento County Superior Court in 1986, his assignments included civil and criminal trials, civil law and motion, and family law. He also served as the presiding judge of the Sacramento Superior Court and as an appellate department judge. Justice Robie was appointed to the Third District Court of Appeal in 2002 and has served as an associate justice pro tem on the Supreme Court of California. Justice Robie has been chair and vice-chair of the California Center for Judicial Education and Research (CJER) and has taught judicial ethics for CJER, the B. N. Witkin Judicial College of California, and at numerous programs for the California Judges Association (CJA). As a CJA member, he served on its executive board and judicial ethics committee. 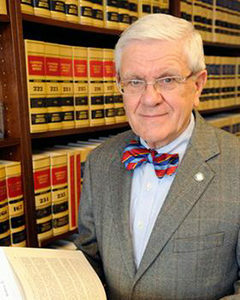 Justice Robie has long been an active member, author, and teacher in several environmental and water law organizations. He has also been an adjunct professor of law at McGeorge School of Law, University of the Pacific, which awarded him Alumnus of the Year in 2016 for his public service. Nationally, he is a member and has served on the board of directors of the National Center for State Courts. In California, he has served the judicial branch and the public as member of the Judicial Council, the Commission for Impartial Courts, the California Constitution Revision Commission, and the Federal-State Judicial Council. He has also served as a special master for the Commission on Judicial Performance and as a member of the California Supreme Court Advisory Committee on Judicial Disability. Justice Robie received the Ronald M. George Award for Judicial Excellence in 2011, the National Center for State Courts Distinguished Service Award in 2014, and the Justice Bernard Jefferson Award for Excellence in Judicial Education from the California Judges Association in 2017.